Movement is the visceral essence of music. It's the proverbial carrot on a string that keeps our minds engaged and ears yearning for more. 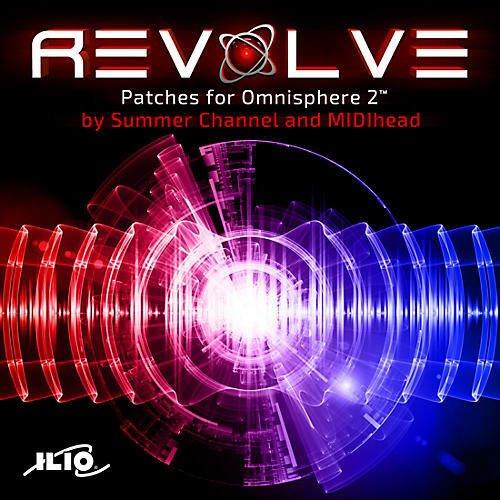 Jesse Scott of Summer Channel and MIDIhead are back again to present a new patch library for Omnisphere 2 called "Revolve." Inside, you'll find a cornucopia of arpeggiated synths, heavenly bells, twisted bass lines, and phantasmagorical plucks that will add intrigue and movement to your music. And since Revolve is genre-agnostic, you'll find plenty of inspiration whether you're working on the next soundtrack for a suspense-thriller, chilling down with ambient, going pop with a vocal melody on top, or creating heat for the dance floor. From super-resonant, detuned synths, to intense and suspenseful movements, to growling pulsations, to plucked and airy sounds, Revolve will provide you with plenty of inspiration for any mood you wish to create. Included are over 100 inspiring new arpeggiated patches, and as a bonus we've also included 10 Multis to show you the layering capabilities of Revolve!